Please note that the content of this book primarily consists of articles available from Wikipedia or other free sources online. 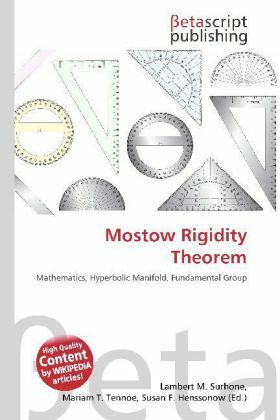 In mathematics, Mostow''s rigidity theorem, sometimes called the strong rigidity theorem, essentially states that the geometry of a finite-volume hyperbolic manifold (for dimension greater than two) is determined by the fundamental group and hence unique. It is the leading example of the types of statements that occur in rigidity theory. While the theorem shows that there is no deformation space of (complete) hyperbolic structures on a finite volume hyperbolic n-manifold (for n 2), for a hyperbolic surface of genus g 1 there is a moduli space of dimension 6g 6 that parameterizes all metrics of constant curvature (up to diffeomorphism), a fact essential for Teichmüller theory. In dimension three, there is a "non-rigidity" theorem due to Thurston called the hyperbolic Dehn surgery theorem; it allows one to deform hyperbolic structures on a finite volume manifold as long as changing homeomorphism type is allowed. In addition, there is a rich theory of deformation spaces of hyperbolic structures on infinite volume manifolds.